My parents and I have just returned from our yearly goat manure collection trip. We always go to the same local ranch to pick up enough goat manure for the summer planting. The manure has been "collecting" all year in the goats' pens, so thank goodness it doesn't smell like the manure at the nursery store. It is actually already composted and compacted. To harvest it, we go to the pens, my dad breaks up the clods of manure and shovels them into a bag my mom holds. Here are the little goats that produced our manure, which in turn will produce the best organic vegetables. My parents always used goat manure back in Calabria and they searched the San Francisco Bay Area for many years until they found a rancher who had goats. The manure is free, because the farmer is more than happy for us to take it away. The nutrients in the manure of cows, rabbits, chickens, sheep, horses, or goats will do wonders for your vegetable garden. If you happen to know of a farm or ranch that has animals and you don't mind harvesting their manure, you're in luck. Otherwise, go to the nursery and buy it already packaged. Don't worry; the store-bought stuff works just as well. Mix it in the soil at least three weeks before planting your vegetables. Don't be stingy. My dad spreads two inches of manure over the soil and mixes it in well. If you have a small garden or a few raised beds or planters, a few bags will do. So...how much manure did we pick up? 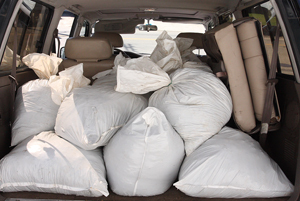 Well, it was a total of 16 bags of about 50 pounds each, because that's all that would fit in my truck. This will be enough for my garden and my parents'. My dad will work in the manure with his "zappa," an Italian hoe. This is his only gardening tool. 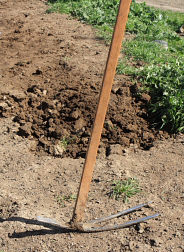 He uses it to do everything: turn the soil, mix in the manure, make trenches for planting the vegetables, and till the soil. He brought his zappa from Calabria when we moved here, because he knew he would not find one in California.